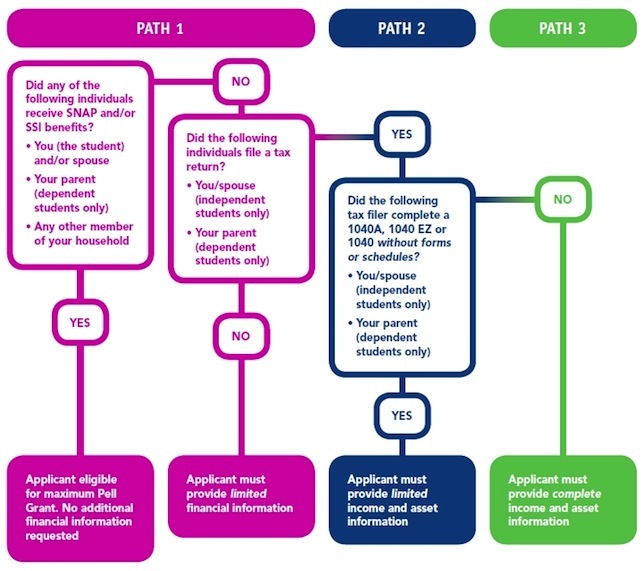 Concerned that a bill from two United States senators proposing just two questions to determine financial eligibility for college will gain traction, a national organization of financial aid professionals has presented an alternative for simplifying the process of applying for financial aid. Earlier this summer, as part of discussions related to reauthorization of the Higher Education Act, Senators Lamar Alexander (R-TN) and Michael Bennett (D-CO) proposed a solution for simplifying the Free Application for Federal Student Aid (FAFSA). Currently, the application typically asks 108 questions — and as many as 136 — to obtain a federal grant or loan for college. That's too many, a bipartisan group of senators have said. Their proposal, named " Fast Act," would reduce the form to two questions: "What is your family size?" and "What is your family income?" A working group within the National Association of Student Financial Aid Administrators (NASFAA) acknowledged that the application is too complex, but said that approach would be an over-simplification. Their alternative is to propose a three-pronged pathway that would decrease the number of questions posed to people with the greatest need for financial aid. The first path would screen people by asking if the student or another member of the household where the student lived, such as a parent, received Supplemental Nutrition Assistance Program (SNAP) or Supplemental Security Income (SSI) benefits. If the answer were yes, the applicant would be eligible for the maximum Pell Grant amount. No other information would be needed. If the answer were no, a second question would be asked: "Did the student or parent file a tax return?" If that were answered no, then the applicant would have to provide "limited" financial information. If the answer were yes, the student would be moved into a second path that gets more complex. "We approached FAFSA simplification not in terms of the numbers of questions students and parents need to complete, but rather how we could ease the burden on students and families while still maintaining our ability to decipher the truly needy from those who may simply appear needy," said NASFAA President Justin Draeger. "Our proposal utilizes existing federal databases, better application timing, and enhanced technology to make the process easier for everyone, but most especially for students from disadvantaged backgrounds where FAFSA complexity represents a real barrier to college." Even for the most complex pathway, NASFAA suggested, the process of filling out the FAFSA paperwork could be simplified by allowing families to import much of the required information directly from their tax returns. The organization, which had other recommendations, said it would begin working on a model of its proposal. The 12-page NASFAA report is available on its Web site.